JUNE 13, 2017 AT 5:30 PM. GCA’s Annual Meeting was held on June 8 at Rector House in Atoka. We had a successful turnout for the presentation of our Annual Report which was handed out to all attendees. 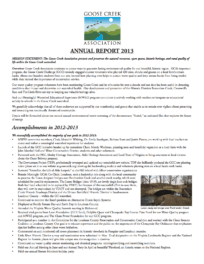 Our Annual Report summarizes our efforts in 2014 and recognizes that our members, sponsors and friends and their support is how we protect the Goose Creek watershed. 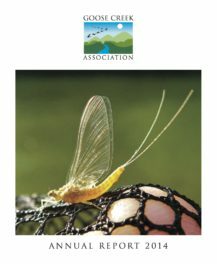 Please read our Annual Report for more updates and information about GCA. GCA’s Annual Meeting speaker, Kimberley Fogel, Director Community Development, Fauquier County, spoke about Fauquier County’s policy on future telecom development. Telecommunications continue to play a vital role in economic development in the County. The impact of transmission structures is considerably evaluated within the framework of protecting the areas’ natural and historic resources. Read Kimberley’s report for more information (attached) on County activity and priorities on this important issue. Download the 2015 Annual Report here! on Monday, June 8, 2015 at 5:30 p.m. 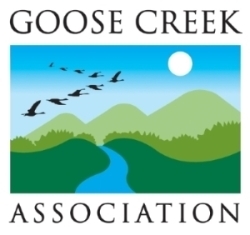 Throughout the history of the Goose Creek Association (GCA), this small organization had been relevant to our area by leading and participating, along with other environmental and historic organizations, on many issues. 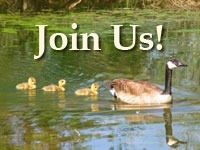 We’ve helped make a difference by being specific in our love and attention to the Goose Creek watershed. That is why we still matter. 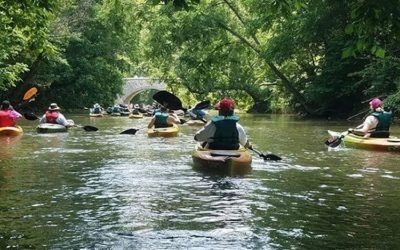 We are still at a size that is meaningful and accessible to all those in the Goose Creek watershed who want to contribute to keeping this area as beautiful and pristine as it can be. For instance, The Little River Rural Historic District was a glimmer in many citizens’ eyes for several years, but it took the GCA to organize, raise the funds and get it done. On February 14, 2014 (happy Valentines’ Day! ), The National Register of Historic Resources accepted the Little River Rural Historic District into its fold. Northern Fauquier is now virtually covered with historic districts, the majority of which the GCA sponsored. GCA also sponsored the Beaverdam Creek Rural Historic Roads District in Loudoun County and will continue to sponsor historic districts throughout the watershed. Historic Districts slow down public works, roads, and development, while enabling residents to obtain tax credits to restore contributing resources such as their homes. Further, GCA’s ongoing stream and water quality monitoring program is one of the oldest such voluntary programs in the state. The counties are sporadically stream monitoring in some impaired areas, but GCA actually has trained some of those folks to do what we’ve been doing for over ten years. GCA did not wait for the Goose Creek to become impaired to establish benchmarks for our watershed. We are committed to educating the future generation about the importance of Goose Creek and are demonstrating this stewardship with school children as part of our educational mission. 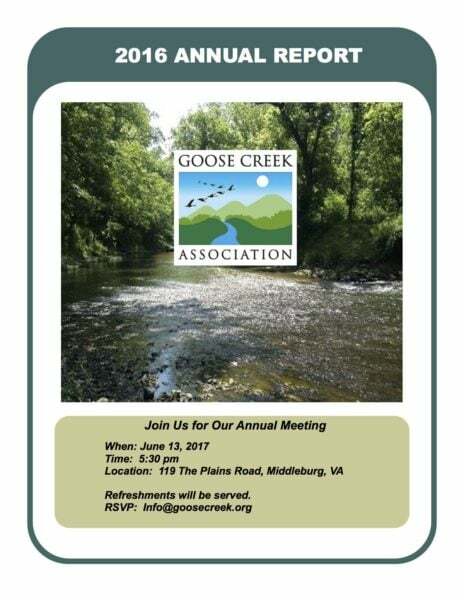 GCA will continue to exist as long as we have the resources and volunteers to make a meaningful impact on the historic and pristine Goose Creek watershed. Please join us on the Board, as a contributor, and as a volunteer to continue to make GCA matter. GCA held its successful Annual Meeting on June 10 at the Rector House in Atoka. Guest speaker, Tom Akre, with the Smithsonian Conservation Biology Institute gave a fascinating talk about his work with the wood turtle. The turtle has been affected adversely by development and human encroachment in its habitat. 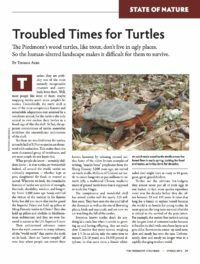 Our attendees were struck by how vulnerable the wood turtle was and how important it is to learn about their plight.